[AUTO](VC) Limit Break 4 (This ability is active if you have four or more damage):[Counter Blast (2) & Choose two of your «Shadow Paladin» rear-guards, and retire them] At the beginning of the guard step of the battle that this unit was attacked, you may pay the cost. If you do, choose an opponent's rear-guards not attacking or boosting, and retire it. [AUTO](VC):When this unit attacks a vanguard, this unit gets [Power]+3000 until end of that battle. ...I honestly have mixed feelings about this one. Etain has 10,000 Power, which is pretty meh nowadays though she becomes 13,000 when she attacks, so she can at least fight and force out shield against any opposing unit currently out, so that's always nice. Her Limit Break is where I'm kind of wish washy about. When she is attacked, you can Counterblast 2 and sacrifice 2 Shadow Paladins to retire any unit on the opponent's field that isn't involved in the current battle. What really bugs me is the cost as it's a steep one not from the sacrificing but from the Counterblast 2. Shadow Paladins have a nice way of retaining field presence whether it's Macha, Nemain's drawing or even Tartu, but all of those require Counterblast as well to work, which make cards like Cursed Lancer viable as he's able to help reuse a certain amount of damage, but even then, it still seems like a bit too much in my opinion as most of the popular units require at least 1-2 Counterblast, and for Etain here, while her effect is nice seeing how it can either prevent an attack or weaken it, I still feel that cards like Il Doña and The Dark Dictator can be better as they make a bigger threat than her. 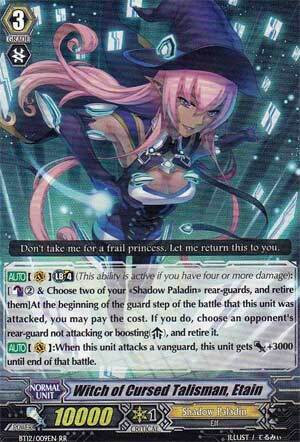 Etain isn't a bad card, but there are just better choices than her. Next Time: I mentioned this card in this review. 4th card of the week, and we have quite a weird character. Etain gains 3k when she attacks a Vanguard. Nothing we haven't seen before; she's a column former with Charon to swing for 21k. But you don't use her for that. You use her for her Limit Break. And it's strange. When she's attacked, you sack 2 rear-guards and CB 2 to murder a unit that's not currently attacking or boosting for this battle. Immediately, you realize that this is for turning two units, 5k shield average for a total of 10k shield, into something to block an annoying card and kill it off permanently. But really, I'm not a fan. It's a bit inefficient considering it's Counterblast 2 for a +0 wash (you don't have to lose a card guarding, so you save 1, and the LB makes you -2 to -1 the opponent, so relative -1). Not only that, when you do use her, you're at a point where you have to spend quite a lot to stave off your death. So actually replacing what dies for the same columns afterwards is difficult. All in all, not for me. I prefer Ildona over her, and even then, I STILL wouldn't recommend Ildona for today's format either.